How can any Rav HaMachshir be employed by a company to whom he is giving a Hechsher? Seems RMGR ended up as a ‘nefal’, aborted from the (cash) cow! The business wouldn’t have existed without him and it shouldn’t exist without him. I hope no orthodox rabbi will touch it. They seem out to lunch. How do they expect to get anyone to give a hechsher to such an enterprise. The problem with meir was that he would give a hechsher to such a place, not how he did it. They seem to think it’s possible to give a hechsher to their farm. On the contrary, the theory behind this enterprise seems sound; the problem was that the certifying rabbi is not reliable. If a serious, responsible rabbi, with an impeccable reputation, can step in and verify that what was done until now is up to snuff, and ensure that it continues to run according to halacha, then this may actually take off. Gedolei haposkin such as Reb Chaim and Reb Herschel have already come out against it. 2. How could anyone serious verify from the past without starting over. Would be like walking into a butcher store and giving a hechsher on meat on the shelf that’s already been processed. How could anyone serious verify from the past without starting over. Through a combination of geviyas eidus, and DNA tests. 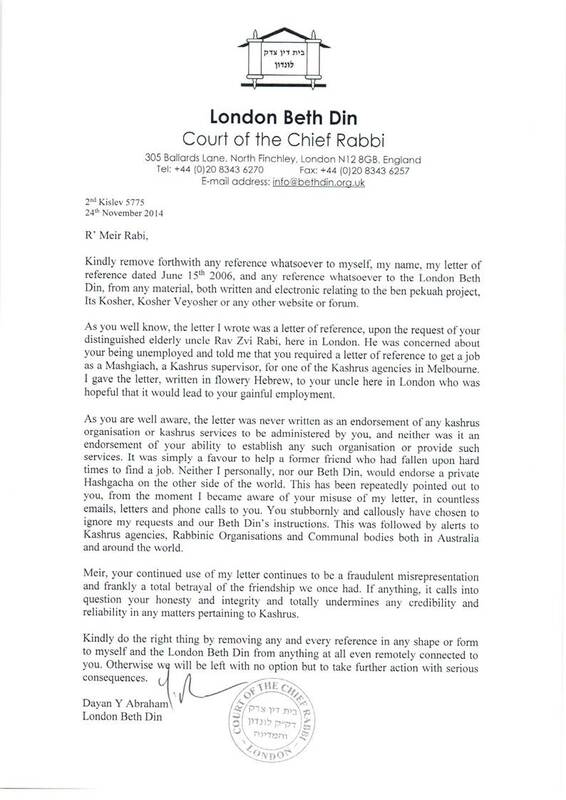 I suggest they will need to start over as MG Rabi cannot be considered a Posek of repute on any issue in my opinion (and that of many Gedolay Horoah that I have spoken to). You and I both see many of his posts elsewhere going back many years and one is wasting their time arguing with him. R”L you should say that his hechsher is subclass. It is self-evidently much more powerful than other hechsherim, as seen by the difficulty of replacing it. Anyone here remember when R’ Zaichyk removed the Mizrachi’s MK hechsher from Glicks? and actually competing not only with MK, but also with his father, R’ Chaim Gutnick who was privately hechshering Ungars catering)? And that with mind-bogglingly speed – less than a hour – immediately announced that Glicks was Kosher and now under his supervision!! This happened without even a courtesy tel call to R’ Zaichyk – or Mizrachi investigating why the hechsher had been removed!! And 6 months later, Mizrachi hired the same R’ M Gutnick to head their own MK – and since then all “private” hashgachot are chazir treif! Isn’t it time for Mizrachi to make a similar offer to R” Rabi? Or will they be approaching Bloch and Nixon to come under their wing? R Zaichyk was provably unreliable. I don’t wish to embarrass his family but the solid evidence was also presented to current president who at that time was agitated with the absolute unadulterated proof (which I still have). As to days gone by, you are being rather silly. There were a multitude of Hechsherim. Unlike many I saw them and their standards not only as a Mashgiach but also as a band leader. Don’t even ask me to go back in history. Rabbi C. Gutnick’s hechsher with Ungers actually went to the Shule. I saw the books. The Melbourne Beth Din was mamash I don’t want to say, and as to courtesy to Zaichyk. Oh spare us all. Your selective מעריב ערבים had zero courtesy for anyone. There is absolutely NO need for a private Hashgocha now. The community has grown up. They should look at South Africa and take a leaf out of their hechsher. I repeat a blog post of mine. 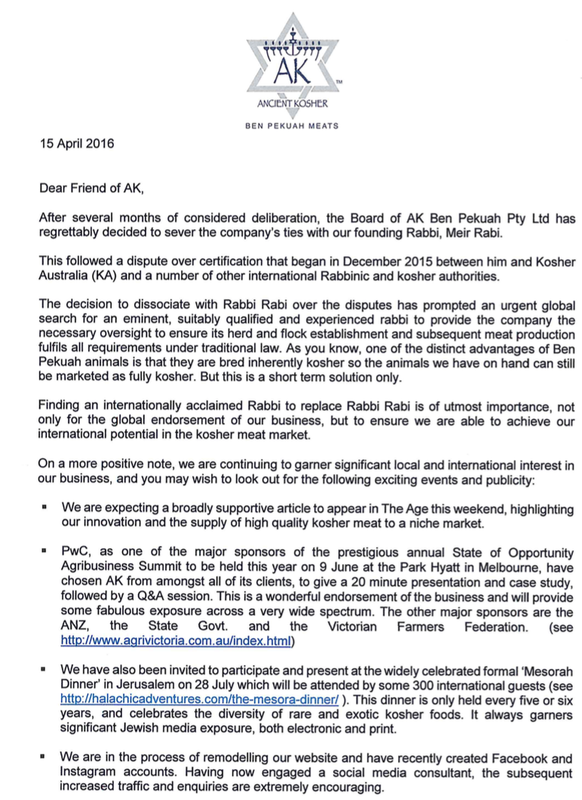 Melbourne’s Kashrus should be under the Beth Din and separate from the money operation. I was present at a COSV meeting when then Mizrachi treasurer John Kraus asked that Kashrus be taken off Mizrachi because it was losing money. I also remember very clearly that Mizrachi subsequently withdrew the offer. All of this is history. We only have one Maverick now in Melbourne. He suddenly switched from Kosher Australia being unacceptable to acceptable after ‘deep investigation’. My foot.